The first step to configure the Very Top Bar in Hestia is to activate it from Customizer. 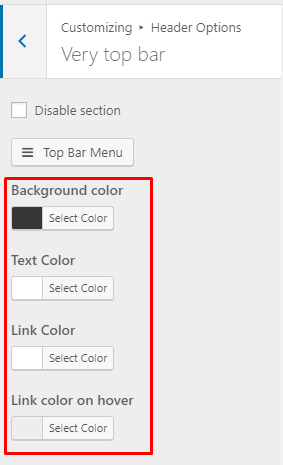 Navigate to Header Options > Very Top Bar and uncheck the "Disable section" option. The section is disabled by default. The premium version of the theme, Hestia PRO offers some extra options you can use to customize the Very Top Bar section. 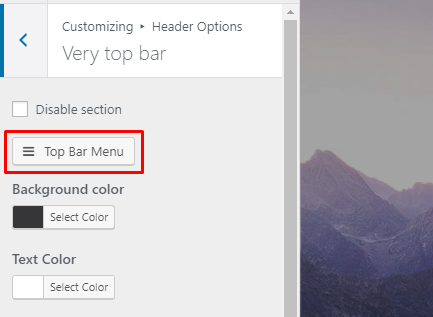 Note: The Very Top Bar menu is supporting only one-level of dropdown menu. E-mails and phone numbers will be preceded by icons only if the links are preceded by tel: and mailto: in the URLs, otherwise, they will be displayed as normal links. Very Top Bar layout is composed of a menu and a widget area. By default, the menu it's positioned on the left side while the widget area is on the right. In Header Options > Very Top Bar, you also have an option to change this layout. Note: Only the area on the left side will be displayed on mobile devices (responsive mode). If you want to have only one of the areas ( menu or widget area ) you need to just don't select a menu for the Top menu location or don't add widgets in the corresponding widgets area.